An awards season strategy is born. 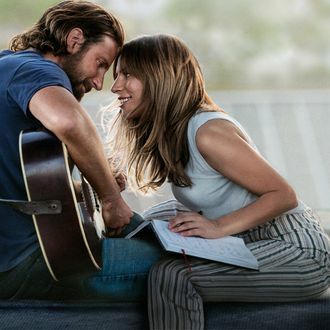 Photo: Warner Bros.
A Star Is Born is in the Shallow, watch as it dives in … to drama! Per Indiewire, both A Star Is Born and the Freddie Mercury biopic Bohemian Rhapsody will compete in the 2019 Golden Globes’ drama category. Despite A Star Is Born’s original (and very good and easy to obsess over) soundtrack, and Rami Malek lip-syncing Mercury’s songs for Bohemian Rhapsody, their respective studios are pushing both movies as dramas. The Hollywood Foreign Press has final say on which category is deemed appropriate, and the deadline for submissions isn’t until October 31. The movies that look to be competing in the musicals/comedy category include Disney’s live-action Mary Poppins Returns, Mamma Mia! Here We Go Again, Eighth Grade, Ocean’s Eight, Crazy Rich Asians, and The Favourite.